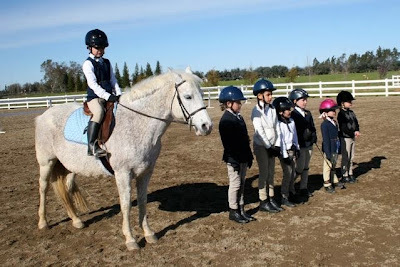 Our 2010 Dragonfire Academy Schooling Show Series started off big with our March Show. It was a day filled with happy riders, sun, and yes... WIND! 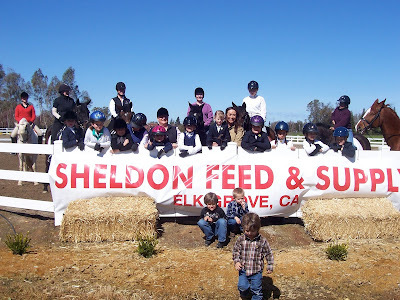 Thankfully, our hearty spectators were not deterred when it came to cheering on the competitors, and Judge Ron Smith gave positive and encouraging feed back to those with questions about their rides. Nancy Dein rode two entries in the show, with victories on both mounts. First she won the Advanced Pattern on Harrison. And then, much to the delight of her daughters, Nancy piloted Cricket to a first place vote in the Open Walk/Trot Rail Class B. All of Nancy's hard work and dedication to taking several lessons a week were quite apparent at this venue. Another hard working student that didn't go unnoticed was Makena Graber. She and her own horse, Sugar, were picture perfect for the win in the Open Walk/Trot Rail Class A. Proud mom and volunteer at our show, Tracy, presented Makena with her her prizes donated from Sheldon Feed and Natalie Jensen's Mary Kay business. Not to be out done, Morgan Connolly made her first victory pass of the year aboard Will in the Advanced W/T/C Rail Class. Morgan and Will have really begun to cement their partnership, and I expect we will see more success from this talented duo. 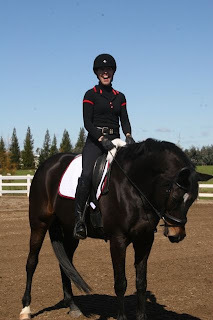 The Adult Walk Trot Pattern Classes were both extremely competitive and well ridden. Emerging on top in the A split, was Janet Rau piloting Aida. Giving us a glimpse of what the future holds for this rider, Janet's white-hot performance was undeniable. Christina Underwood and her own mount, Star, was clam, cool, and collected for the win in the B split of this class. This pair is well on their way to a fun filled year together. The deepest class of the show was the Youth Walk Trot Advanced Pattern B with seven very good riders vying for the top slot. Hard fought and well deserved, Hana Roseberry emerged victorious. Riding Rosie, our current Student of the Month really showed her fans what she knows! 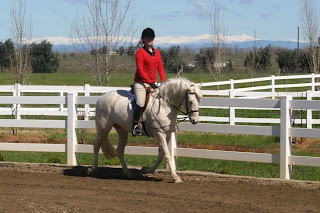 The Youth Walk Trot Advanced Rail also warranted an A and B split. Proving tough to beat and Winning Class A was Alyssa Hansen with Nick. This is their second time winning this class, as they won it at our November Show, also. With Alyssa's bold showmanship and savvy presentation of Nick, there is little room to wonder why she is such a contender. The new team of Taylor McFall and Ace was irresistible for the win in the B split. Taylor's first win at an Academy Show was made extra sweet when she was presented with a sparkling "wand" crop and goodie bag for taking the top prize. New-comer, Sarah Blazek showed no fear as she claimed top honors in the Youth Walk Trot Beginner Pattern. 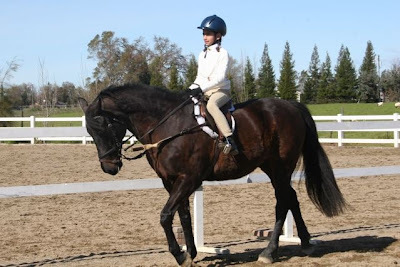 It's obvious that this girl has the makings of a top show rider in the years to come. The sister act of Kaitlyn and Brianna Sipes is one to watch out for with both girls coming away with a win. Kaitlyn effectively guided Aida through the Youth Walk Trot Advanced Pattern A, while Brianna took the Youth Walk Trot Beginner Rail Class blue. These were the first of many wins for all three of these girls. Both the All Walk Pattern and the Leadline evoked so much delight for our judge that three-way ties went out to both classes. In the pattern class, it was Wren Posey, Tali Leucchetti and Frank Leucchetti receiving the blue ribbon and bucket-o-prizes. 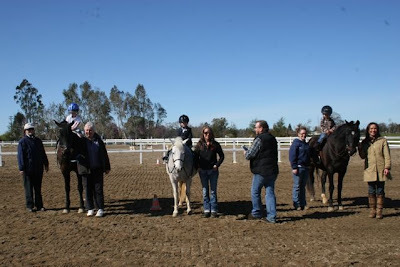 In the Leadline it was Emma Roseberry, Rocco aka Goofy Leucchetti, and Travis Posey charming the socks off Judge Ron Smith. Taking the Best Turn Out Award at this show was the adorable Taylor Andrade. No matter what she wears, she has a smile that can make any outfit memorable! With two more shows in the series to go, the Adult High Point and the Junior High Point are any one's game. Also, the Overall Sportsmanship Award is still up in the air. With so many fantastic riders in the Academy, this series is proving very exciting!